For a heart-stopping hour, it appeared a nation’s collective worst fears had come true. On Black Friday on Britain’s best known and busiest street, packed with Christmas shoppers, commuters and school children, it seemed that terrorists had struck. At 4.37pm, hordes of people on Oxford Street were convinced they had heard the sound of gunfire and explosions. It was a false alarm, but whatever they heard – or for that matter didn’t hear – prompted a stampede for cover. Shoppers ran for their lives, certain they were under attack. All this happened at Metro station. Oxford Circus is a London Underground station serving Oxford Circus at the junction of Regent Street and Oxford Street, with entrances on all four corners of the intersection. The panic was set off here as people ran helter-skelter thinking that there was terror attack. Media reports further add that two men questioned over an altercation that sparked panic in London's Oxford Street on Friday have been released without charge. The pair - aged 21 and 40 - were quizzed on Saturday after attending a police station voluntarily. British Transport Police are investigating after panic erupted inside Oxford Circus Tube station. A number of people were injured, with nine hospitalised, after people fled the station amid reports of shooting. Armed police were sent to the scene and initially treated the incident as potentially terror-related. Police later said the incident - which resulted in the temporary closure of two Tube stations - may have been caused by an altercation between two men on a Central Line platform. The debate on need for Circus will not go a long way – though was a great entertainer and crowd puller a few decades ago, now a days, people think that it is someways cruel to make animals bend and do unnatural things which they are wont to. More cruel is the blood sport called ‘big game hunting’ – it is more of killing rather than any game ! It is the most degrading and cruel of fates for the king of the jungle. Bred in captivity, lion cubs are torn from their mothers while still blind, a few days after birth. MailOnline reports that growing up, they are petted as playthings for tourists until they are ready to be released into small enclosures where they will be shot and killed by wealthy trophy-hunters in what are known as ‘canned hunts’. What is great in shooting and killing an animal by heavily armed men with the hunted denied of escape route too and that is not the end – the final indignity is visited upon the dead lions: for the carcasses are sent to the Far East to meet the enormous demand for ‘medicines’, jewellery and even wine made from the remains. Sadly, this has been the horrific destiny for 800 lions from South Africa this year alone – and it is entirely legal, as the government rubber-stamps export licences for the lucrative industry. China’s insatiable demand is fuelling the trade in the lion bones, while shameful products from the callous trade are also on sale in other South East Asian countries including Thailand, Laos, Cambodia and Vietnam. It is a sad irony - consumers in the Far East believe the bones come from tigers and therefore, in their minds, have almost magical medicinal properties and are seen as aphrodisiacs. But the strict laws now protecting tigers has led to increased use of lion bones by unscrupulous traders. 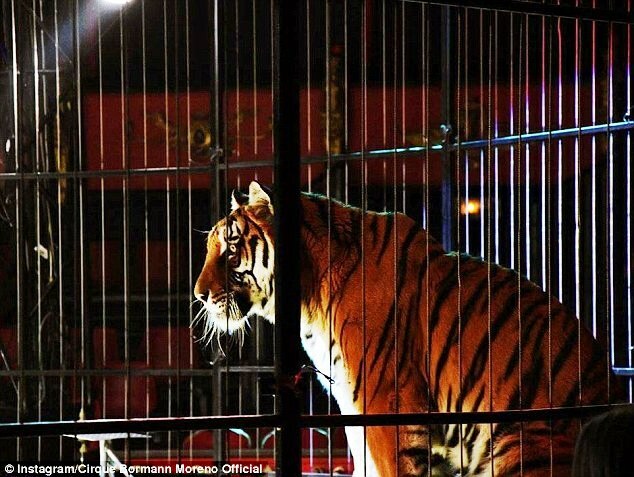 But this tiger was not that lucky – it escaped and was shot dead on the streets of Paris by its keeper. Eric Bormann killed the one-and-a-half-year-old tigress called Mevy after people spotted her wandering around the French capital's 15th arrondissement on Friday. He claimed that the cage door had been cut open in an malicious act. Police quizzed Bormann for several hours after the incident, and an investigation has now been launched. The Circus boss could face a prison sentence of up to three years for the offence of 'putting lives in danger'. Mevy weighed 200 kilos - just over 31 stone - and was considered an immense danger to the public as he roamed around the streets of Paris. The beast was cornered at the Garigliano Bridge by armed police and killed by circus boss Eric Bormann, who claimed foul play. He told AFP: 'I'm the one who takes care of my tigers. There is a whole security protocol to respect with big cats.' He said the animals were in a cage secured by another enclosure. Circuses in England were banned from using wild animals in their shows from December 2015 and a two-year 'grace period' for owners to get rid of them is now coming to an end. Until recently, some 20 licensed animals were still working in circuses, including camels, zebras and snakes. However, there have been no big cats, elephants, zebras, snakes, monkeys, gorillas or chimpanzees working in English circuses for years.